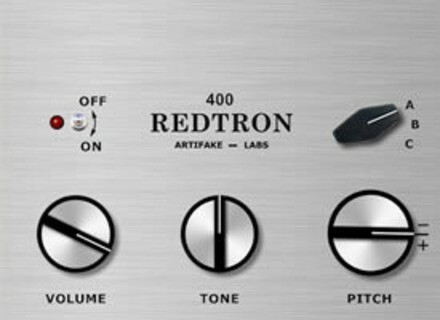 RedTron_400, Virtual Sound Module from Artifake_Labs. Artifake_Labs has released RedTron_400, a free sample-based VST instrument plug-in for Windows that emulates the "Mellotron M400". Six sound types: 3 Violins, 8-Voice Choir, Flute, Brass, String Section, Cello. "Loop" and "Non-Loop" modes: as the original "Mellotron", each sound is eight seconds long but you can switch to "Loop Mode" which allows the samples to loop continuously. o Volume, Tune, Reverb, Delay, Pan, Octave, Note, Cutoff, Resonance, Attack & Release parameters. o Delay effect (Amount, Time, Feedback & Pan parameters). o Reverb effect (Mix, Width, Size & Damp parameters). Can be used as SoundFont Player to mix any .sf2 file with "Tron sounds" or to extend the sound palette. ToneBytes Bend Box ToneBytes has announced the release of Bend Box, a software synthesizer that emulates a circuit-bending device.